OMG! Do you remember shrinky dinks? I do. I loved them and apparently still do. 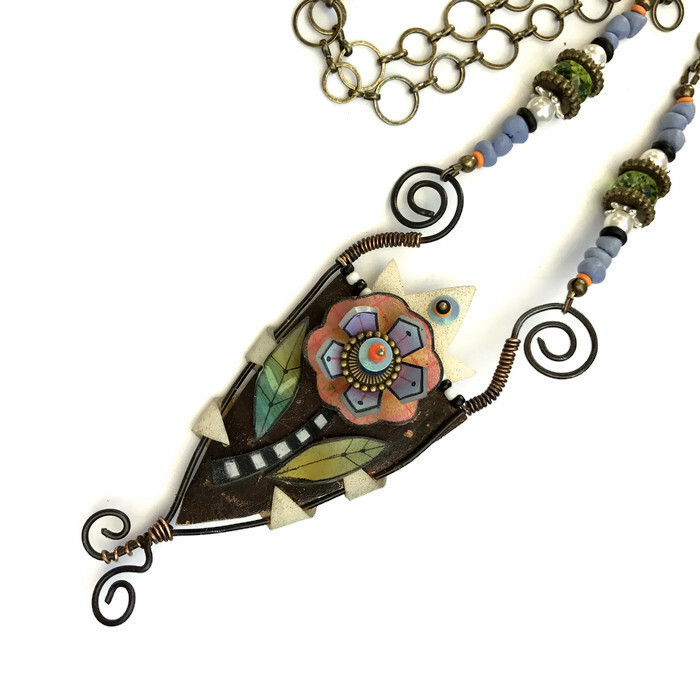 Julie Haymaker is an amazing mixed media artist who specializes in shrinky fun! Imagine this, trace a pattern on thin plastic, color it with colored pencils or markers, shrink it and magic happens. I’m all over these flowers for future needlepoint canvases. Won’t that be fun. Join us for crafty days and leave with your projects finished. Well, you can if we don’t goof off too much. Celebrate the end of Summer with a pretty new necklace. 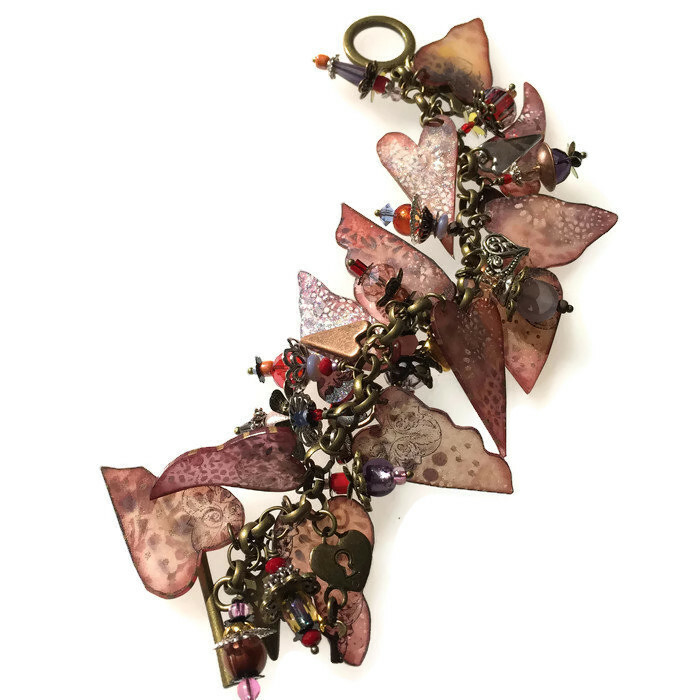 Mix hand hammered metal, wrapped wire and shrink plastic flowers formed with molds. How fun is this? 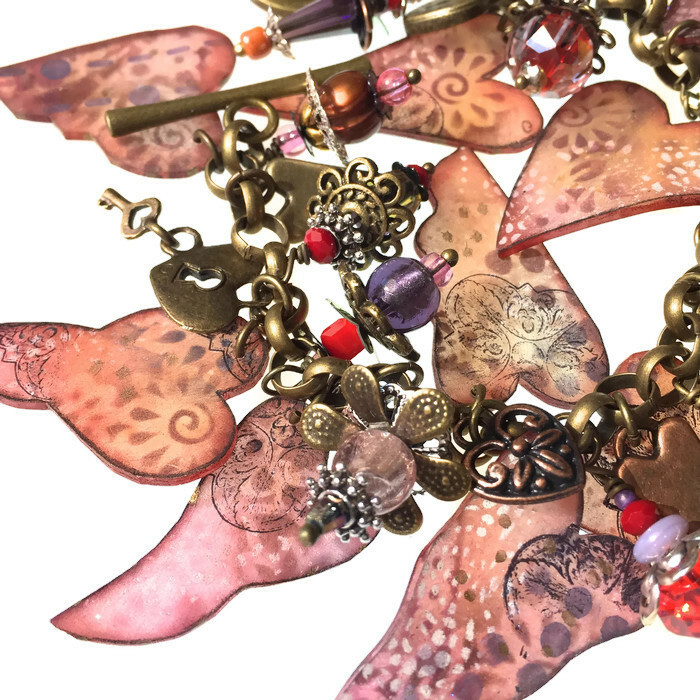 Create a light weight elegant and romantic shrink plastic bracelet using Shrinkets opulent shrink plastic, stamps and inks. Combine your hearts with supplied pre hand-wired beaded dangles and heart charms on an open link bracelet. I’m in love with this bracelet. First of all I love charm bracelets. Second of all, I can see using these same flowers on a needlepoint canvas. How cool is that??? We will form shrink plastic into flowers and leaves using molds! Trace, color, cut and heat. Violá. 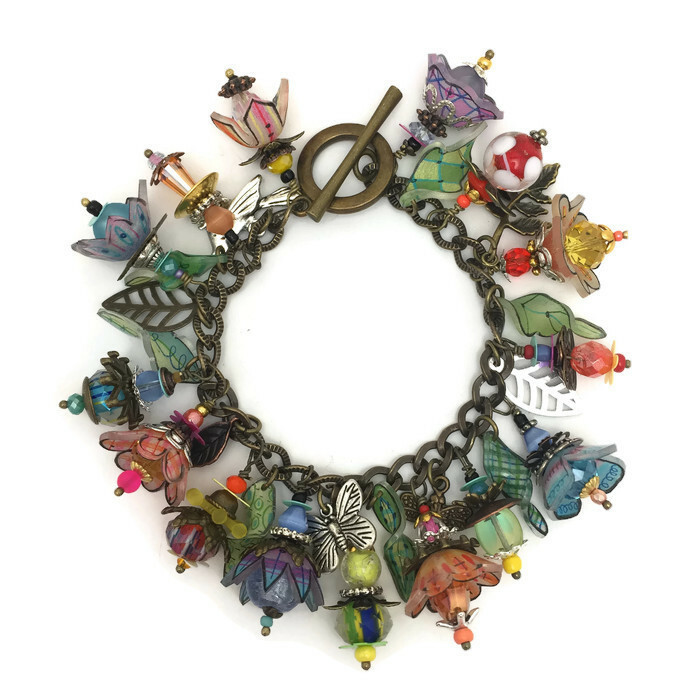 Each kit will include 10 hand wire wrapped beaded charms (without shrink plastic beads) along with all the tools and materials to make a complete bracelet. 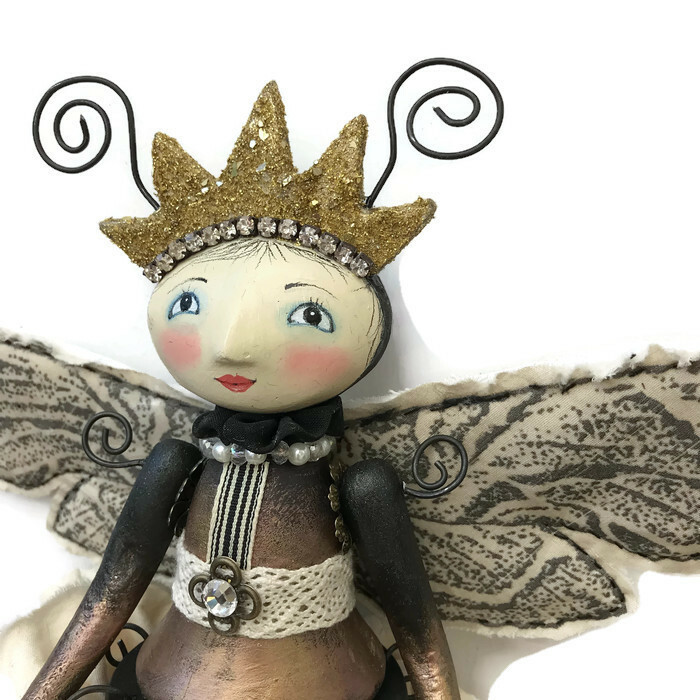 Our Moth Queen rules the night .Her face will be painted on one of Julie’s ready to paint plaster doll heads. Paper clay demos such as slab forming and tube rolling will be part of the class and used to creating simple doll parts. Stamped images are used to create the fabric wings that are also hand stitched. 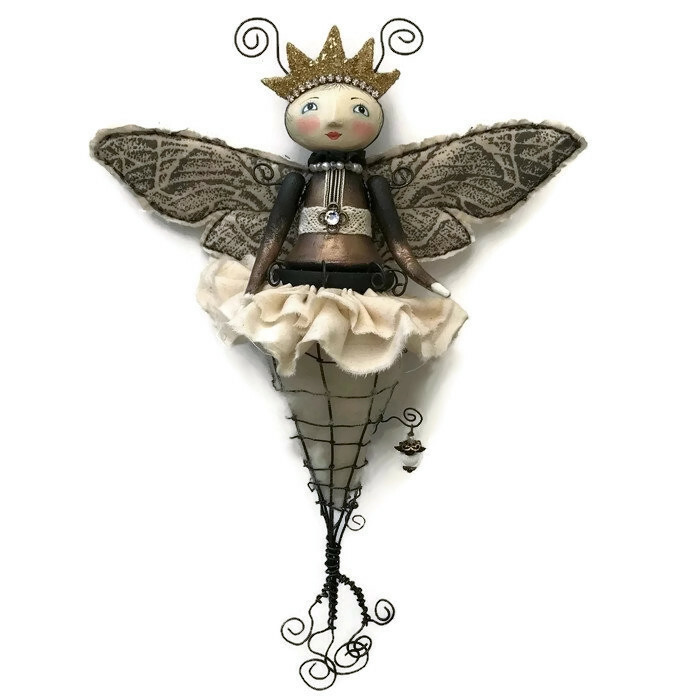 Our dolls wooden body is painted with iridescent paints and is adorned in gathered laces and fibers. I hope you can join us for one or more days. We always have such a good time. Deposits are required at signup with balance due one month before class. « Previous: Barbara Elmore is offering a cyberclass! Wish I lived closer to be able to easily come and play! Can you order the supplies for the necklace if you live far away or a finished product? We will have kits and supplies available and Julie will be bringing finished pieces so you will have choices. Watch the blog for pictures.